(CBS News) WASHINGTON — In the days leading up to a public allegation that Supreme Court nominee Brett Kavanaugh exposed himself to a college classmate, the judge and his team were communicating behind the scenes with friends to refute the claim, according to text messages obtained by NBC News. 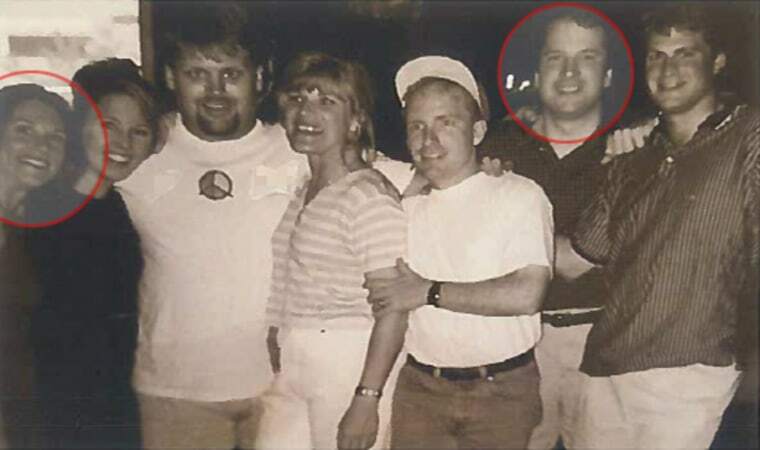 From left, Deborah Ramirez, Kerry E. Berchem, Doug Millet, Karen Yarasavage, Kevin Genda, Brett Kavanaugh and David White pose for a photo at the rehearsal dinner before the wedding of Yarasavage and Genda in 1997. (The Week) What does it look like when the Supreme Court loses its legitimacy? We don't want to find out. WASHINGTON (AP) — Chief Justice John Roberts is referring ethics complaints against new Supreme Court Justice Brett Kavanaugh to federal judges in Colorado and neighboring states. (American Prospect) Buried in an October 9 Washington Post poll of battleground congressional districts, one set of numbers jumped off the page for those of us who have, for two painful decades, tracked the slow-motion train wreck of the Supreme Court. Trump has a very high chance of getting 1 or maybe 2 more supreme court seats...If he can hold the senate the court will probably be right wing for the next 35 years. Yeah, Breyer and Ginsburg are the two oldest justices at 80 and 85 and are both left leaning. If either of them or both of them retire before Trump leaves office, I'm going to be in my 50s before the courts have a chance at being left again. Washington (AP) -- The Supreme Court says 85-year-old Justice Ruth Bader Ginsburg fractured three ribs in a fall in her office at the court and is in the hospital. Its a life long appointment , right ? So if any extensive life extension apear in the next 35 years , it the appointment legnth will have to be revised (or the courts is never going to be left again). I imagine that eventually judges will either retire as a matter of principal or the senate will amend the constitution and impose term limits on the justices. Maybe with anti-aging we can set the term limit at 50 years for the Supreme court. I don't know if it's just me, but Sarrah Day O'Conner looks suspiciously like Paul McCartney. I can certainly see it. Old Paul must have been wearing drag! (The Atlantic) Among Chief Justice John Roberts’s many talents is an ability to mask ambition. Though conversational in chambers, about the day’s headlines or the Notre Dame game over the weekend, he is by nature reticent. Law clerks don’t feel they get to know him as well as, say, Justices Clarence Thomas and Stephen Breyer. So a few years ago, when the chief let his guard down, the moment astonished his listeners. And it revealed a hunger for greatness that went along with an abiding affection for the institution he leads. Among Chief Justice John Roberts’s many talents is an ability to mask ambition. Though conversational in chambers, about the day’s headlines or the Notre Dame game over the weekend, he is by nature reticent. Law clerks don’t feel they get to know him as well as, say, Justices Clarence Thomas and Stephen Breyer. So a few years ago, when the chief let his guard down, the moment astonished his listeners. And it revealed a hunger for greatness that went along with an abiding affection for the institution he leads. The chief justice thought that Obamacare presented a close case and that Congress was entitled to the benefit of the doubt. Seeing himself as the steward of the Court’s prestige, Roberts chose to keep the Court out of harm’s way. He had failed to do so, for example, in Citizens United (the 2010 ruling that struck down campaign-finance regulations passed by Congress) and Heller (the 2008 ruling that invalidated handgun restrictions imposed by the D.C. city council). But now, at least in this one case, four months before a presidential election, he had become a judicial statesman—an advocate not for this or that issue, but for the Court itself. Maybe he was acting with the judicial humility he had often counseled for others—judicial “politics” in the best sense. If so, in an age when the Supreme Court has become aggressively interventionist and triumphantly ascendant, Roberts’s destiny might be, as he wished aloud, to do great things. The alternative risks even further descent by the Court into partisan muck—and invites massive opprobrium from the body politic. History has proved that ends very badly for the Court. But wouldn't you also agree that it's equally appealing for judges who have many decades (even centuries) worth of judicial experience to remain as Justices since they will apply the rare, hard-to-get wisdom to cases that have everlasting implications?